Heat gas or charcoal grill. In small bowl, mix all marinade ingredients except salmon. 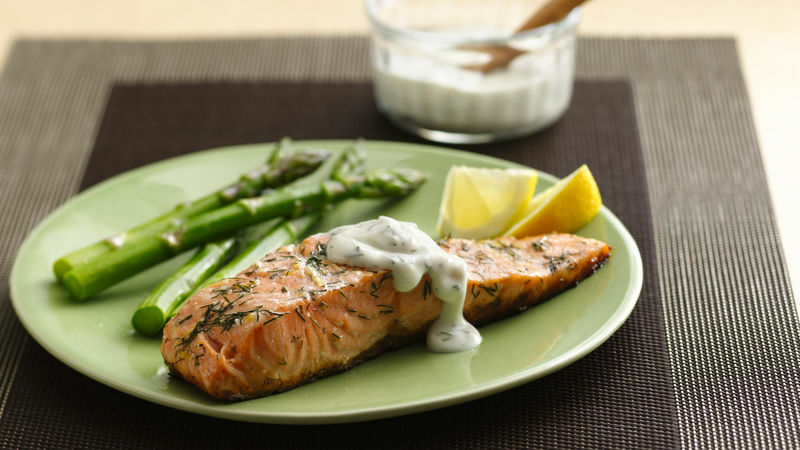 In 8-inch square (2-quart) glass baking dish, arrange salmon pieces skin side up in single layer. Pour marinade over salmon; turn to coat. Cover with plastic wrap; refrigerate 20 minutes. Heat gas or charcoal grill. Brush grill rack with oil. Remove salmon from marinade; discard marinade. Place skin side down on grill over medium heat. Cover grill; cook 10 to 15 minutes or until salmon flakes easily with fork. Meanwhile, in small bowl, mix sauce ingredients. Serve with salmon. Broiling Tip: To broil salmon, place skin side down on sprayed rack in broiler pan; broil with top 4 to 6 inches from heat using times above as a guide, brushing with marinade during last 8 minutes of cooking time. Substitution: You can substitute lime peel and juice for the lemon in the sauce and marinade for a refreshing lime flavour.